TRUE NORTH SCORES RECORD 3 AWARDS IN LUXURY TRAVEL MAGAZINE’S 2013 GOLD LIST! The TRUE NORTH is the first ever three category winner at the prestigious Gold List Awards. The Gold List Awards are one of the most comprehensive luxury travel surveys undertaken by any Australian publication, with this year’s Gold List celebrating its 9th . 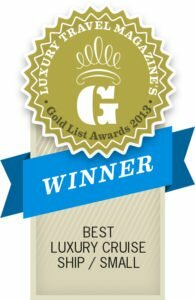 The awards are the result of a survey in which thousands of Luxury Travel Magazine readers and Virtuoso travellers are asked to nominate their favourite hotels, spas, cruise lines, airlines and destinations in over 34 individual categories. TRUE NORTH pioneered luxury adventure cruising along the Kimberley coast over 25 years ago. Sailings are activity based and access some of the most remote and unspoilt coastal areas of Australia, Indonesia and Papua New Guinea. TRUE NORTH’s flagship ‘Kimberley Wildness Cruise’ departs between April and September and features 7 to 13-day itineraries which include the Kimberley’s spectacular gorges, waterfalls, islands and rugged coastline. Daily activities include scenic walks, fishing, snorkelling, diving, picnics and helicopter flights. Shore excursions are accessed via TRUE NORTH’s fleet of 6 dedicated expedition boats and state-of-the-art ship’s helicopter. An extremely knowledgeable and all-Australian crew of 20 including an on-board naturalist ensure that the TRUE NORTH experience is unparalleled. Style, comfort and exceptional food and wine are at the heart of a TRUE NORTH experience. All cabins feature modern décor, en-suites and entertainment facilities, while other onboard facilities include an observation lounge, sundeck and alfresco bar. Modern Australian cuisine prepared with locally sourced seasonal ingredients is complimented by TRUE NORTH’s outstanding West Australian wine selection.